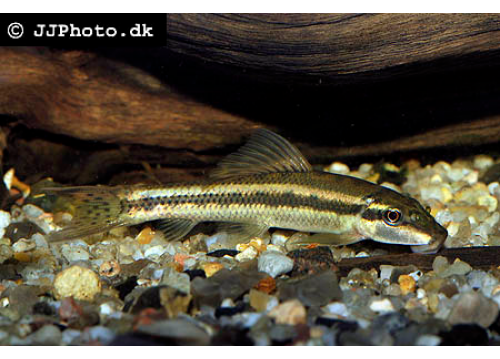 The Gyrinocheilus aymonieri is a very popular fish in aquariums, especially for its characteristic to feed on algae. Very often, however, it is placed in aquariums not suited to its characteristics and its behavior: an adult specimen of Gyrinocheilus aymonieri can measure up to 30cm and although it is quite shy as a child, in growing can develop a certain territoriality and aggression towards tankmates. This aggression can be mitigated by forming a bank of at least 6 specimens to live together, but the tank where they are kept must be of adequate size. In any case, we do not recommend keeping it with other fish that usually stationed at the bottom of the tank, such as catfish or cichlids. The Gyrinocheilus aymonieri is predominantly herbivorous, and prefer algae and phytoplankton, but you can also feed the larvae and zooplankton. In aquarium requires a lot of algae to feed on and in case there are not enough, you must supplement its diet with blanched vegetables (zucchini, carrots), and vegetable food for bottom fish. We have no information about breeding in the aquarium.